How to change color of borders? I have an image of a logo where I need to change the color to blue - but there is a residue of red along the borders of the letters in the logo. See attached file. How can I eliminate this? I see how I can "select by color" and change the filling color, but the lines around - how can I select and change them? 2. Colors -> Color to Alpha using the default white. 3. With Foreground Color = Blue: click and drag the swatch into the canvas. Since the option rich2005 suggests does not appear to be available in 2.10, try inverting the selection (Ctrl+i) and delete the white background. The red will go with it. However, that leaves a rather jagged edge. As I look at the original image, I see the selection accurately reflects the current state of the edge. 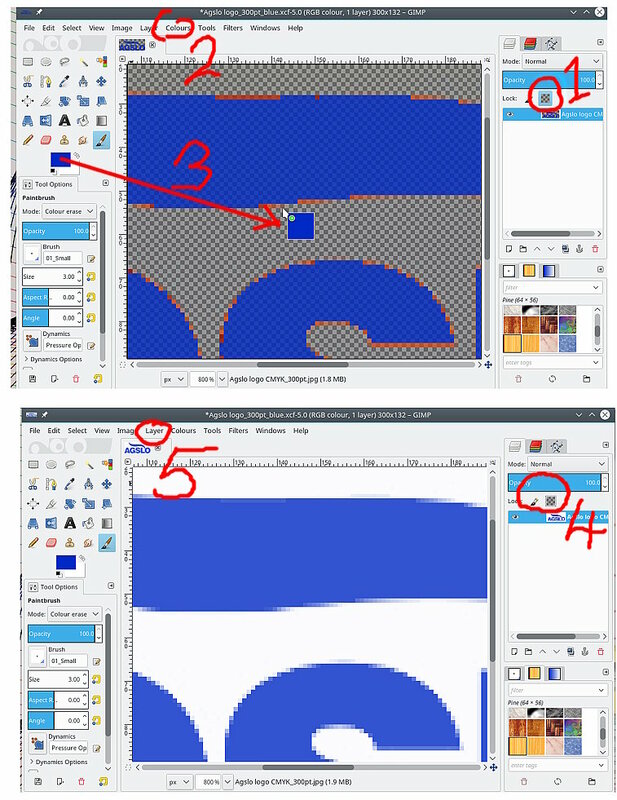 Copying the blue as selected and pasting into a new layer gives the same jagged result. 1) Open the Paths list and convert your existing selection to a path. 2) Convert that path back to a selection. 4) Fill the new layer with blue or whatever color. (02-06-2019, 03:24 PM)Ritergeek Wrote: Since the option rich2005 suggests does not appear to be available in 2.10, try inverting the selection (Ctrl+i) and delete the white background. The red will go with it. However, that leaves a rather jagged edge. As I look at the original image, I see the selection accurately reflects the current state of the edge. Copying the blue as selected and pasting into a new layer gives the same jagged result. Color>Color to alpha or the alpha-lock are still there in 2.10. You can also replace C2A with painting in Color erase mode. However, on Ubuntu, I don't have that left side side panel, with all the selction tools and paint tools etc. I can open various dockable windows, and arrange them, but not that "default" panel. How can I enable that? As for now, I had to find the correct panels/windows almost by trial and error.. If you have multiple windows open in various location on the monitor. 3. Do not move these, location does matter with Gimp. 4. Use Windows -> Single Window Mode to do what it says. Now size that up to suit your monitor. Thanks for the tip about adding the Alpha channel first. I had finally figured this out, and then your steps worked. I can't see any difference in curve smoothness between using alpha vs. path conversion, but somehow with the alpha conversion, the blue became somewhat transparent. Now, as I try to understand that blue transparency white quit disappearing. Nothing at all changed. Then I used the dropper to selecting blue as the Color. That wiped out all white and left the blue about 50% transparent. Who knows? I notice a GIMP error message: Corrupt 'gimp-metadata' parasite discovered. XMP data could not be migrated: Parsing XMP data failed. Maybe this has something to do with it. Will research that later. (02-07-2019, 12:18 AM)Ritergeek Wrote: Now, as I try to understand that blue transparency white quit disappearing. Nothing at all changed. Then I used the dropper to selecting blue as the Color. That wiped out all white and left the blue about 50% transparent. Who knows? There are elements in the blue that are removed - all the red for example, gives 80% transparency according to the color picker. If the OP was using Gimp 2.10 then the additional control opacity threshold, can adjust that but take care not to wreck the edge anti-aliasing. Quote: I notice a GIMP error message: Corrupt 'gimp-metadata' parasite discovered. Always a good idea to strip Metadata when posting public on the internet. Thanks for bearing with me here. I'm happy for now to stick with the selection to path process. Nice to have alternatives! And thanks for the reassurance about the parasite!